I got this on a whim when NYC made its first appearance in the Kruidvat drugstore a few months back. 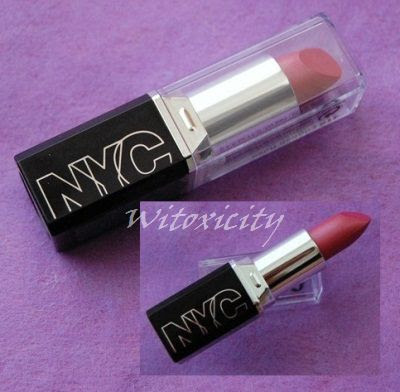 For one fleeting moment, I had thought it was NYX but no, it was NYC for New York Color. The philosophy behind the brand revolves around the fast-paced life of New York and the city's vibrance and vitality. What it comes down to is that it's a budget makeup brand that isn't shy with colours and that offers products that are supposedly longlasting and easy to use. NYC is owned by Coty, the same global beauty company that acquired OPI last year. It's a fragrance powerhouse responsible for the infinite rollout of celebrity fragrances and besides OPI, Coty also owns Sally Hansen, Rimmel and Miss Sporty, just to name a few. Big City Looks at Small Prices is what it says on the New York Color website. 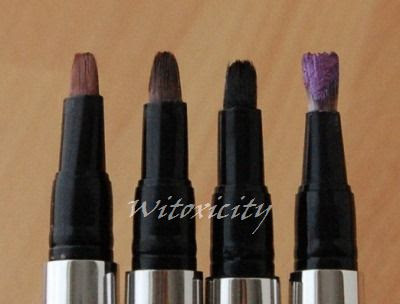 Its price level is around that of Catrice. 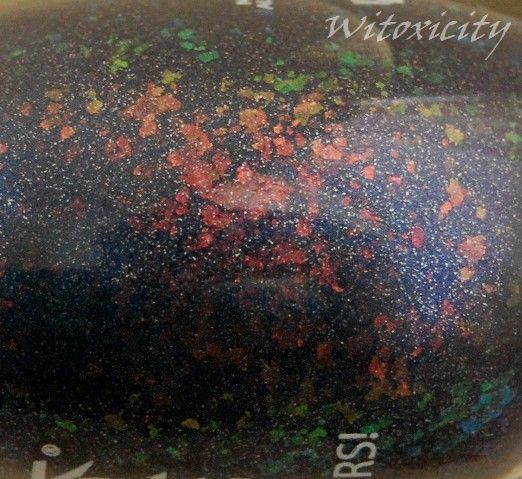 I got a couple of nail polishes (that's greed) and just this one lipstick (that's curiosity). 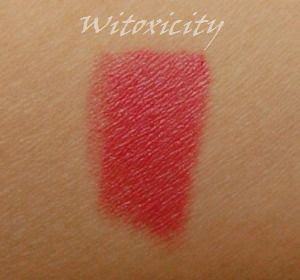 Price of this lipstick: €2.99 for 0.11oz / 3.4g. Re-apply? Who has the time?! NYC New York Color Ultra Last LipWear is wearable, ultra lasting and stays on up to 6 hours. Perfect for your morning meetings and all-night parties. 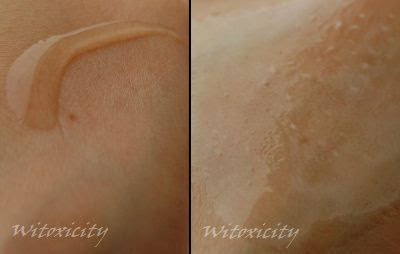 The rich, silky formula is so creamy and comfortable. It's super-affordable too. Great for girls on the go. The shade that I have is called English Rose. 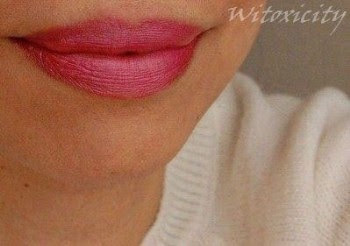 It's a dusty rose colour that takes on a slightly more blue-toned medium pink shade on my lips. The lipstick casing looks terribly bland and basic but then again, OK, it's a budget brand. The thing that I dislike is that the bullet does not go all the way down the casing shaft. I'm sure you can forsee the little accidents that could happen when putting the lipstick cover back on. I believe NYC made it this way for convenience - that it would be easy to see the colour of the lipstick. Well, I find that pointless if what you'll end up with is a dented and/or squished lipstick (been there, done that). 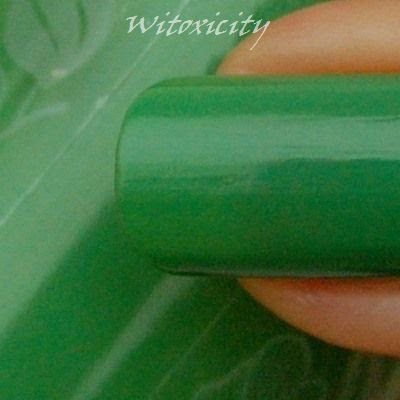 It goes on smooth and creamy and is highly pigmented. 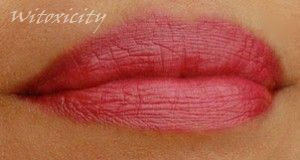 It leaves a slight sheen on the lips and it doesn't feather. It didn't do too badly on the moisturising front. My lips could just about take it without a lipbalm base. Just about - it makes the fine lines on my lips more obvious but it's not so drying that it would make my lips chap and shrivel. Let's get real. This Ultra Last Lipwear won't last six hours. I mean, have you ever bought such claims by any brand? Besides, if it's truly longlasting, it would be ridiculously drying. The colour stays on for two-three hours with some uneven fading. The colour does transfer with drinking and eating. I really don't like the packaging but overall, it's not such a bad lipstick. It's great for throwing around in my handbag as there is no concern about keeping this (ugly) lipstick in immaculate condition. The pricing is attractive, for sure. Just under €3 for a lipstick that was, ummm, made in PRC (it says so on the packaging). 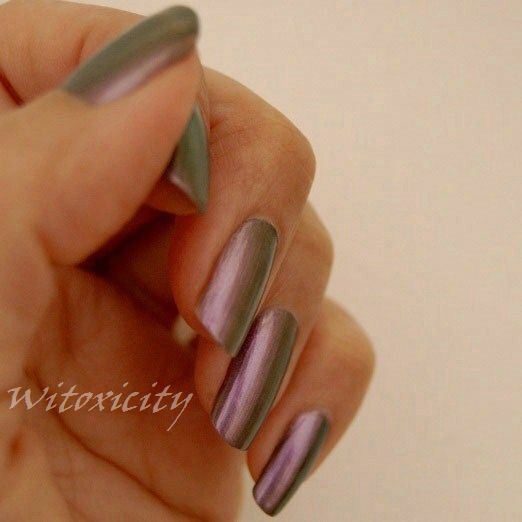 This must be the first duochrome I've ever featured here. Where Is The Party? 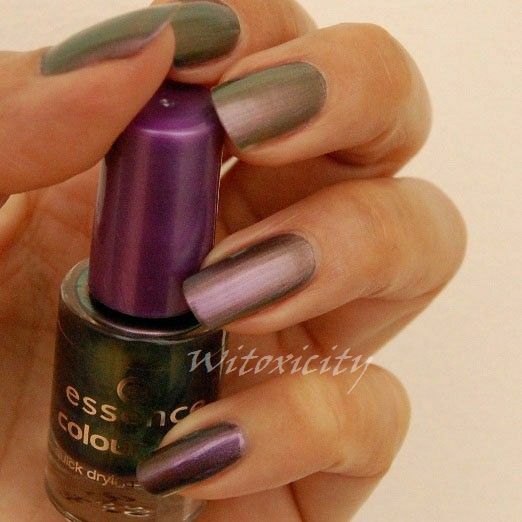 is a metallic duochrome of dark green and purple/lilac (the purple almost matches the purple of the bottle cap). In the bottle, you'd also see aqua at a certain angle. 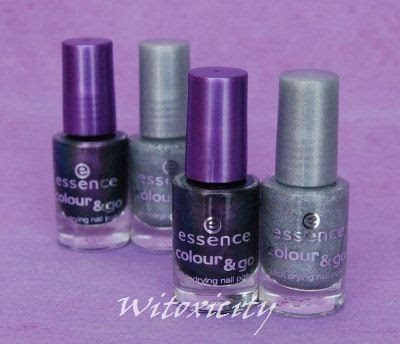 I had a quick look at the bottle of OPI Not Like The Movies at the store the other day and it did remind me of Essence's Where Is The Party?. It's a possible dupe, methinks. I haven't got the one from OPI, so I can't say for sure. The formula for Where Is The Party? is thick. I suggest not draining the brush much before applying. It's best to apply one rather thick coat. In these photos, you are looking at one coat. The nail line is not immediately obvious but if you looked closely in real life, you just might be able to see it. It is touted to have a quick-dry formula but I think the claim's exaggerated. Besides, I had to take into account the fact that I had applied a thick-ish coat. Where Is The Party? is housed in a cute little bottle of 5ml and it retails for only €1.29. 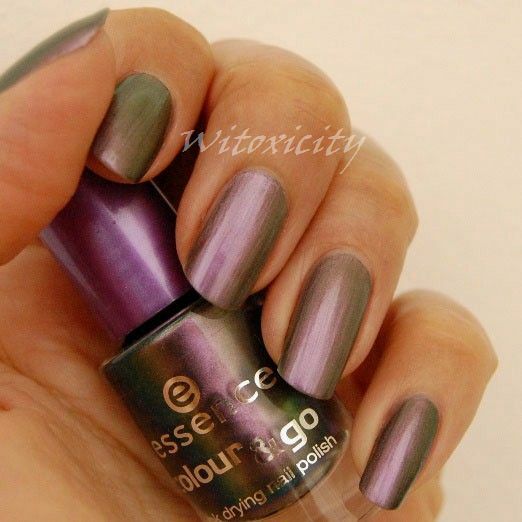 It's a fetching budget nail polish, so whatever its shortcomings, I turn a blind eye. 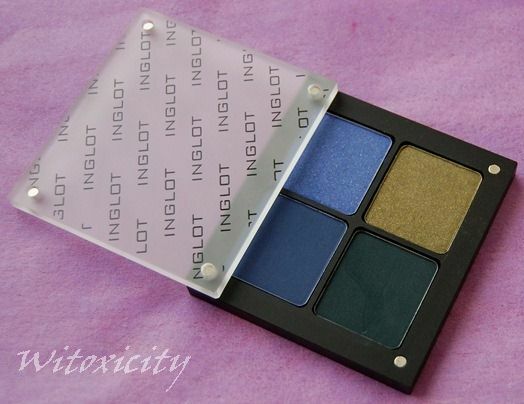 This is another item that I purchased at Inglot a couple of weeks ago. 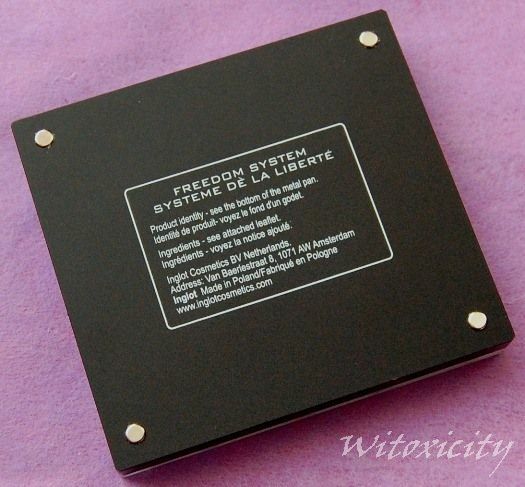 I thought the Freedom System Eye Shadow Palette was interesting enough to have a post of its own. A review of the eyeshadows I got will be done separately. With the Freedom System, personalisation is key. 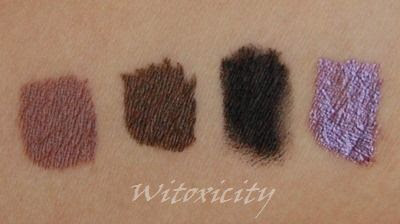 As the name suggests, one is free to choose which type of palette to go for and how it should be filled. You get the colours that you want and (hopefully) will use, thus avoiding the situation of owning a palette with pre-determined colours, some of which you will hardly use. The choice was, to put it mildly, overwhelming. You can choose to have your palette filled with only eyeshadows, with eyeshadows + blush, with only lipcolours, with pressed powder + blush + eyeshadows, etc. The palettes come in various sizes and with various number of pans. After deliberating for a rather long time, I decided to go for a four-pan eyeshadow palette (approx. 3.25” x 3”) – could have gone for three, could have gone for five but at some point, I had to end the indecision. I think the Inglot sales assistants are used to handling indecisive customers day in day out – there are just so many eyeshadow colours to choose from! My Freedom Palette is the version with the glass lid. 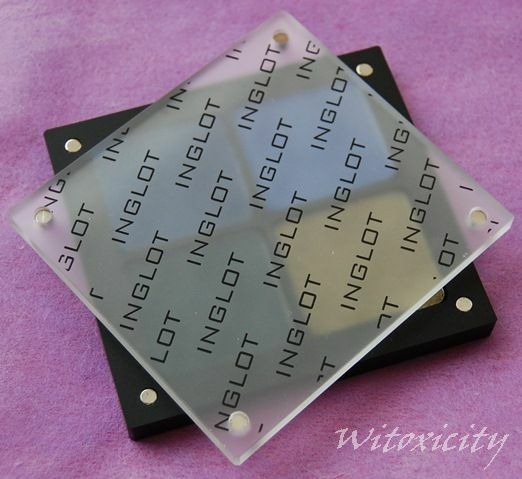 I understand that there are also Inglot palettes which are the conventional ones – a black compact that opens up and has a large mirror inside. Personally, I think the version with the magnetic glass lid looks more chique but is less handy especially as there is no mirror. 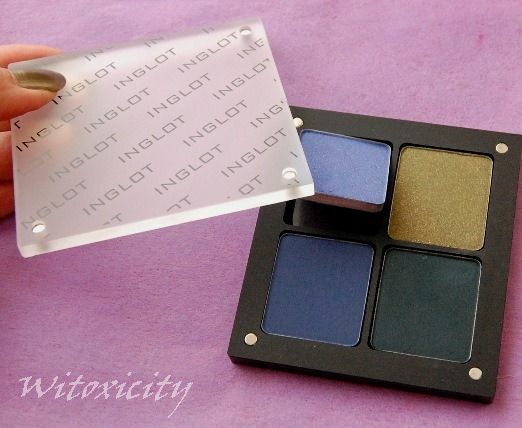 I would have gone for the conventional and handier version but unfortunately, this version is not available at the Inglot store in Amsterdam. The magnetic version is sturdy and feels pretty heavy in the hand. The lid is made of frosted glass and the palette shuts with magnets, in my case, one magnet in each corner of the palette. I think everyone who has this magnetic palette would agree that the magnets are very strong. The way to open the palette is not to pry it open but, as the sales assistant taught me, to slide the cover open like how you would with a fan. Because of the magnetic system, you can actually stack up a few palettes of the same size, keeping the glass lid for only the top palette. Stacking the palettes up, all with their respective lids on, may be risky as the magnets may not be strong enough to hold the weight. 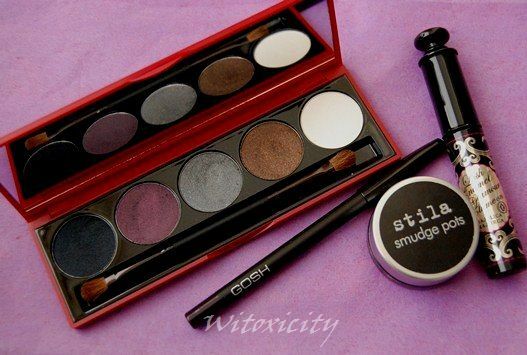 I suppose for makeup artists, it would be handy too to ‘connect’ one palette with another by placing the top palette where the lid is as shown in the photo just above, forming a kind of ‘step’ of two palettes. The magnets for the pans are also very strong. Good: chances are very small that your pans will ever drop out. Bad: it is very difficult to get the pans out of the palette, especially since as there are no grooves where you can put your finger in to get the pan out. I know some ladies use a spatula or something of that sort to dig the pans out. I have tried it with my fingernail before but (1) it didn’t work, (2) you risk accidentally digging your nail/spatula into the eyeshadows, and (3) you risk damaging your fingernail. Use the magnet of the glass lid to ‘pull’ the pan out. 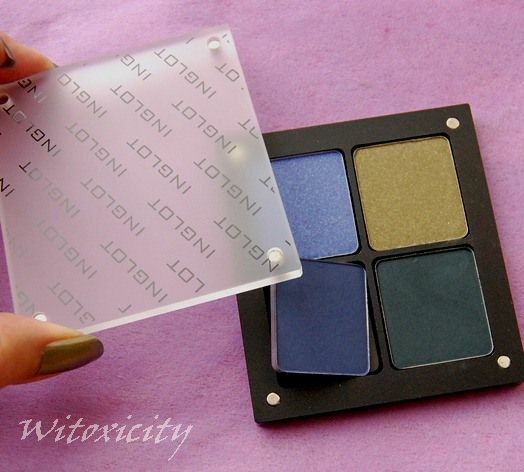 I can’t guarantee that it would work for everyone and with every Inglot palette as I have only tested this with my one and only Inglot palette. It does require some patience and practice. All you need to do is hold one corner of the glass cover (where the magnet is) as close as possible to the corner of the eyeshadow pan. 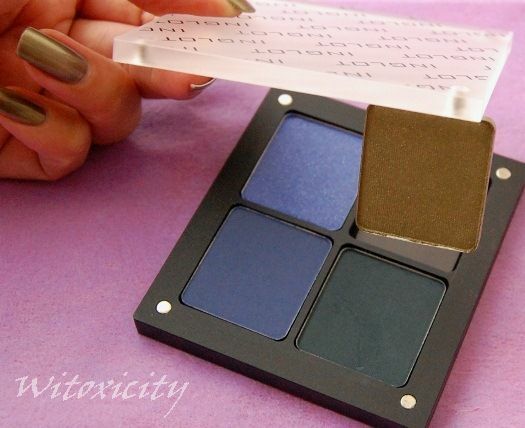 Be sure to hold it level to avoid accidentally scraping the eyeshadow with the corner of the cover. When you suddenly hear a ‘tuk’, you’ll know that you’ve succeeded in fishing one pan out. 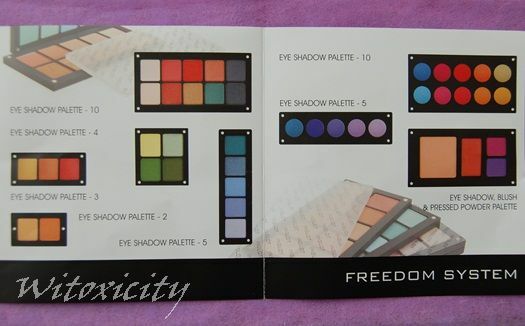 Obviously, the prices of the Freedom System palettes vary according to the size and type of contents. I noticed that the sales assistant herself didn’t know the prices by heart as there were just too many combinations too remember. She had to check her price list. These refer to the rectangular eyeshadow pans. 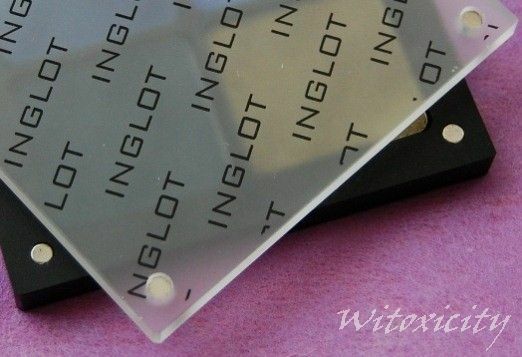 At time of publication of this post, Inglot Amsterdam does not stock eyeshadows in the round pans. It is of course possible to buy the eyeshadow refills separately and the price is in the region of €6 per rectangular pan (exact price would depend on the type of eyeshadow). Again, these are with the rectangular eyeshadow pans. Note: These prices were obtained based on my conversations with the sale assistants. Please check with the Inglot store personnel for more details. My four-pan eyeshadow palette cost €26 but I paid €23.40 for it. 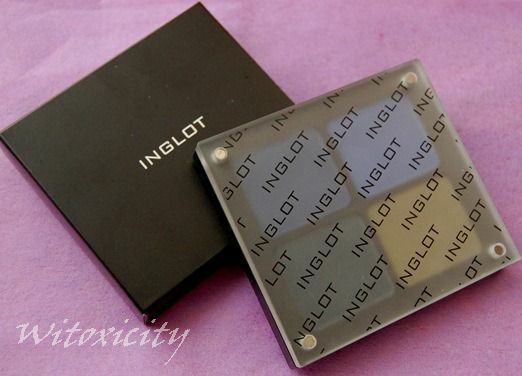 At the moment, customers who sign up to be on Inglot Netherlands’ mailing list get 10% off on their most expensive item on the bill. I believe this is a one-off offer. These palettes are nice to have but I don’t see myself carrying this around in my handbag. Sturdy it may be but it’s just heavy and it's a real pity that it doesn't have a mirror. Stay tuned for the review on the eyeshadows. I bought this months back but, sadly, never got round to wearing it. I just needed a little nudge really and that came a few days ago after an email conversation with a lovely reader. I'd like to refer to her by name, but perhaps it is not her wish to be named here. Well, this one's for you. KOH Blue Universe comes from the same family as KOH Bronzation. It looks foil-like from a distance and even though the blue doesn't look half bad in the sun, this polish is not something you should admire in direct sunlight. Its real beauty is drowned out by all that metallic shine. Blue Universe is a polish best viewed in the shade. 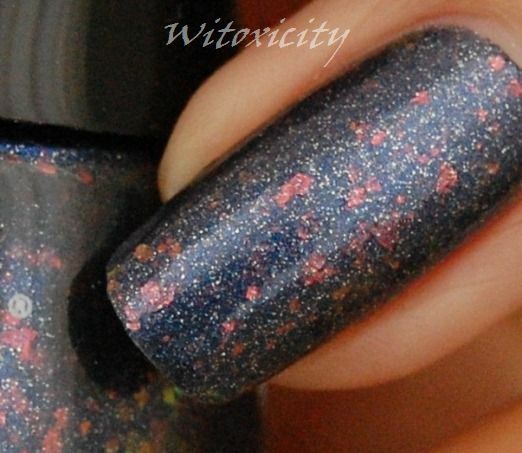 Like Bronzation, Blue Universe has randomly-shaped flakies. However, Bronzation also has small uniform-sized round flakies which are absent in Blue Universe. Instead, the latter is just dense with silver micro-glitters. It applied well and was almost opaque in two coats (three would be better). I however did four on the ring finger (image above) just to get more flakies on. 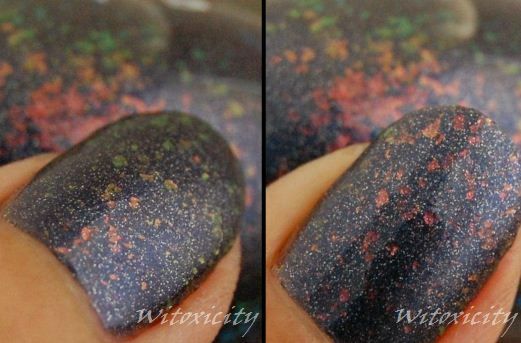 The flakies are dark pink/copper when seen upfront, and yellow and green when viewed at an angle. 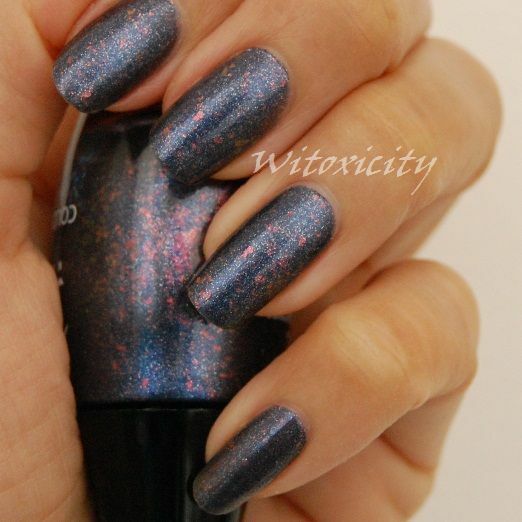 Cosmic blue universe on nails is what you could call this. 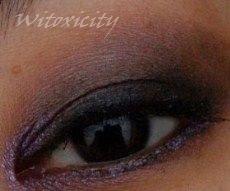 Here's a mainly brown and black smokey eye look with hints of taupe and metallic lilac. If you follow this series of ELLIS FAAS looks, you might notice that it is a variation of Eye Look VIII. 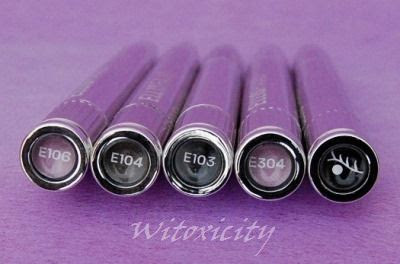 Note: The E104 was my own purchase while the others were provided by ELLIS FAAS for me to review and/or try in the course of last year. 1. Applied with finger the taupe of E106 on the area just above the lid fold. 2. 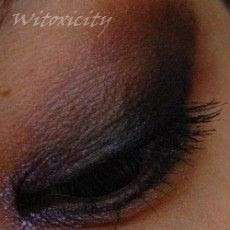 Under that, applied the brown of E104 on the lid fold area and stretching it to the outer corner of the eye. 3. Dabbed on some black of E103 close to the lash line on the outer two thirds of the lid. 5. With a detail brush, applied the metallic lilac of E304 to the inner V.
6. Lined the outer two-thirds with the brown of E104. 7. Lined the whole lower lashline, ie. also going over the brown just applied, with the metallic lilac of E304. 8. Curled lashes and applied mascara. As I mentioned earlier, I'm back in the mood for giveaways again. I am holding another two giveaways featuring nail polishes. Other giveaways featuring non-nail polish prizes are also being planned for later. 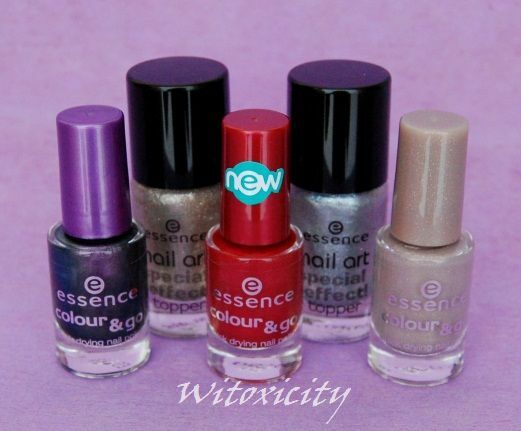 Anyway, I'm sure many ladies living in the Netherlands have been taking advantage of the fantastic nail polish offers at Kruidvat (a Dutch drugstore chain) lately. I was no exception and I thought it would be great to let some of my readers win some of these nail polishes. 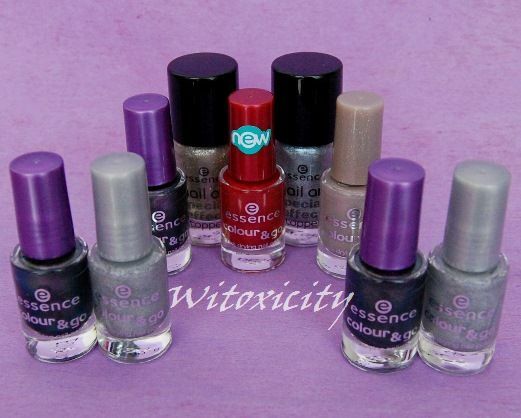 There will be two giveaways: one featuring Essence nail polishes and the other featuring Catrice nail polishes. Each giveaway runs for just under two weeks. 6. Readers who have been regularly leaving comments on Witoxicity (and I already know who you are): You have already bagged one extra point! 7. Submit your entry by 11.59pm (Central European Time) on Saturday, 4th June 2011. A big thanks to all who took the time to participate in this giveaway. 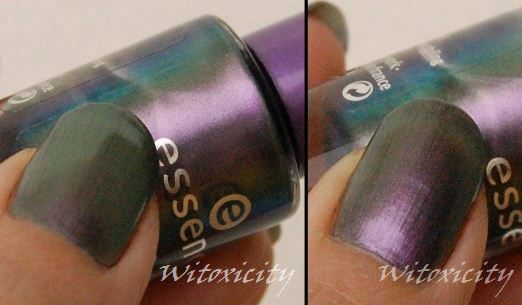 The response was a lot more enthousiastic than I had anticipated, considering that I was giving away only three bottles of this purple holo polish. I'm back in the mood for giveaways this season, so if you don't see your name below, please don't be disheartened. You might want to try your luck in the next one that I will be kicking off later today. Now, let's get on with business. Did I promise three bottles of Teeez Outta Control for three winners? If you know me by now, you'd probably know what's coming next. I bought another bottle of Outta Control last week when I saw the number of entries that were coming in. 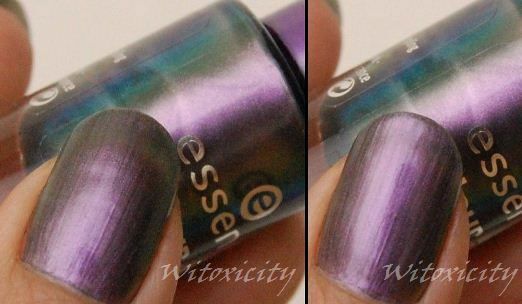 I would have added two but this was the only bottle of purple holo left on the rack. So, yes, there will be four winners instead. Congratulations, ladies! As usual, emails will be sent out to you shortly. Please respond with your postal details within 72 hours. If I don't hear from you in this time, an alternative winner will be chosen. • Every care will be taken in sending out the prizes but I will not be held responsible in the event that a package goes missing in transit or arrives damaged. Stay tuned for the next one that will be starting in a few hours' time. Thanks for your support, ladies! Here's another one from Teeez. 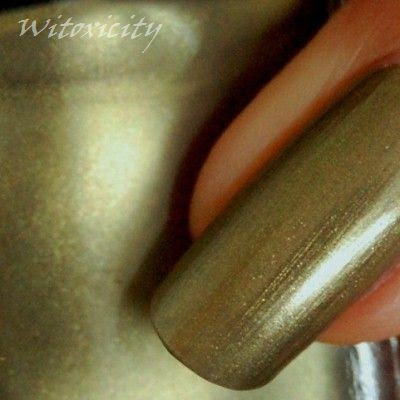 No holo, it's just a plain green crème. I actually wore this last month but didn't have the chance to feature it here. Teeez Free (03) is a bright milky apple green. This kind of green is probably not for everyone (not quite me either but I like variety). It reminds me of tacky-looking green plastic. 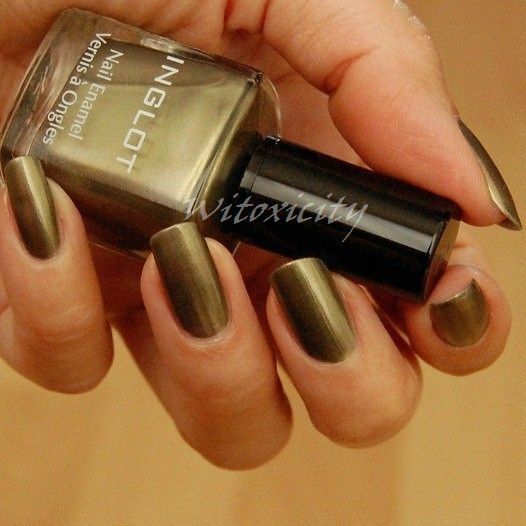 Perfect for summer if you're into show-stopping greens! This one applied very easily. It's on the thick side, so you may be able to get away with one coat. I went for two thinner coats. The rest - drying time and durability - all average. I paid only a few Euros for this, so you won't hear me complaining. I love citrus-scented bath / shower products. I think they are the best for a morning pick-me-up and this particular body wash totally does it for me. The scent is a lovely mix of sweet mandarin and ginger, a spicy sweet scent that immediately transports me to the Orient. Occo is dead-on with its description of this range: Citrus Spice. However, the proper name for this product is (oh, it's a long one!) 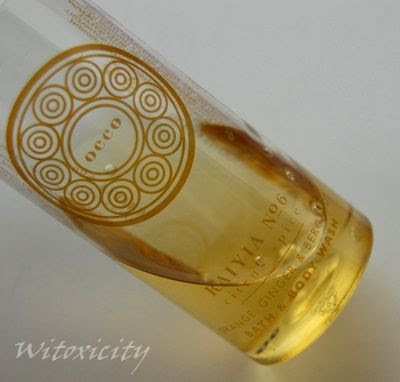 Raiyia No6 Bath & Body Wash, Orange, Ginger & Bergamot. 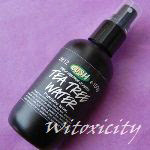 It is an oat-based cleanser and does not contain Sodium Lauryl Sulfate (SLS). Active ingredients: Sage Oil, Lemon Essential Oil, Orange Oil, Bergamot Oil, Oat, Coconut Oil. Benefits: Vitamin-packed orange oil, uplifting bergamot and gentle oat-based cleansers help to enliven your skin, enhance circulation and give you a real tonic. Natural aroma oils of ginger and mandarin will reawaken your mood. This product is 99% Natural. Water, Coco-Glucoside, Cocamidopropyl Betaine, Sodium Lauroyl Oat Amino Acids, Cocamide DEA, Sage Oil, Orange Peel Oil, Lemon Peel Oil, Bergamot Fruit Oil, Glycerin, Parfum (100% natural), Citric Acid, Ethylhexylglycerin, Magnesium Nitrate, Magnesium Chloride, Methylchloroisothiazolinone, Methylisothiazolinone, Phenoxyethanol, Benzyl Alcohol, Linalool, Citral Limonene. The coconut oil is not named on the list per se. Instead, what appears on the list are coconut oil derivatives (those starting with coco- or coca-), which I suppose are meant as surfactants and/or foaming agents in the formula. This golden liquid is a gentle body wash and does not dry my skin out. As expected, you don't get much foam with this. It lathers just enough to give you the impression that it's doing its intended job. Does it do a good cleansing job? Come on, a body wash is a body wash is a body wash. The spicy citrus scent dissipates quite quickly during lathering. On the skin, it takes on a rather raw scent, so by the time I walk out of the bathroom, there is hardly any spicy citrus scent left on the skin. That's all right. I may like citrus-scented bath products but I don't like walking around smelling of citrus. There is a difference. I got this 100ml bottle as a gift-with-purchase. The normal size is 250ml which retails for £18 (yes, luxury indeed). My 100ml (plastic PET) bottle should last about three weeks. Occo is a new, natural, luxury, spa and lifestyle brand harnessing the diverse, rich, natural resources of the unspoilt Dalmatian Coast and Adriatic Sea. Occo is the brainchild of Anna Doyle who has had a successful corporate career in the health and beauty industry. Two other ladies (Yasuda Avery and Katy Simpson), themselves with well-established careers in retail interior designing and brand/product creation came on board. Together, they launched Occo in the UK last year. • uses soy inks and 100% recyclable packaging. The Occo range of products includes body lotions, body scrubs, bath & body oils and wash, hand lotions and hand wash. I think it's worth pointing out that Occo is not a Croatian brand. It is really a Croatia-inspired brand based in the UK. As far as I know, the ingredients are sourced in Croatia, the products are made in the UK and its natural fragrances are blended in France. In any case, I read on Occo's website that they've opened a spa in Dubrovnik and I believe more are to follow. Ms Doyle really loves Croatia. 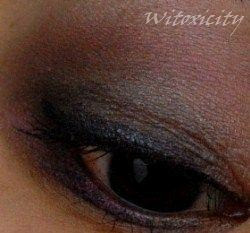 Here's the eye look done using Gossip, Stage Cosmetic's Five-Shade Shadow Palette that I featured yesterday. Yes, it's simple - I like simple. Yes, it's safe - I usually stay within boundaries. It may be fun but face painting is not my thing. 1. Applied an eyeshadow primer (not shown) on the upper and lower lids. 2. 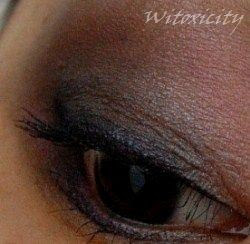 Used a large dense eyeshadow brush to pack on the grey eyeshadow on the outer two-thirds of the lid. 3. 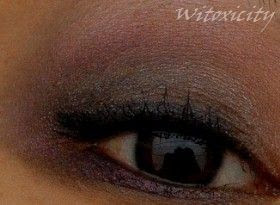 Used a crease brush to apply the purple eyeshadow to 'create' a crease. 4. 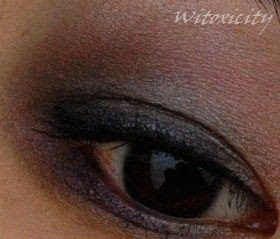 With a smaller eyeshadow brush, dabbed on some of the black eyeshadow on the outer corner. 5. 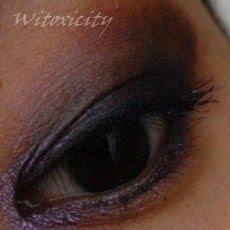 Applied a thin layer of the white eyeshadow on the inner V and on the brow bone area (above the purple). 6. Used a blending brush to blend all the colours out. 7. Lined the lash line with the dark purple of Funky Violet from GOSH. Wing it slightly. 8. Tightlined with the gel liner of Stila Smudge Pots. 9. 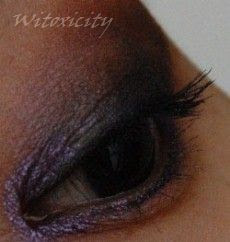 Coloured the lower lid with a hint of the purple eyeshadow, forming a big, vague outer V with the purple of the upper lid. 11.Curled lashes and applied mascara.